← Searching – First & Main OWIE CLUB Bandaged GRAY TABBY CAT "OWIE MEOWIE"
wooooooooohooooooooooooo I did get it, and just my price!!!!!!!!!!!! Thanks guys!!!!!!!!!!!!!! I am looking for a large black dog from TY. It was made in 1994. I was pretty sure it’s name was Cinders, as this has stuck with the dog since purchase, but cannot find this dog online or ANYWHERE. And searching for Cinders only pulls up a TY bear. His name is indeed Cinders. His item number is #2008. He was only made in this position in 1994 – he should be 20 inches long, but don’t worry if he is not because their measurements are not often accurate. As I said, made in 1994 only – in 1995- 1997 the same dog (Cinders) was made in a sitting position. FYI – there is an adorable little pup that is “baby brother” to Cinders – his name is Ashes. I say Baby Brother, because he is only 8 inches long – he is very similar – he is so cute. I purchased this dog from a Cracker Barrel before my oldest son (soon to be 9) was born, and he fell in love with it. He really wants to know what the name of the dog is, as he has other Ty dogs with the names on the tag. He loves the dog so much I want to get a backup, so he can have one to give his child one day. 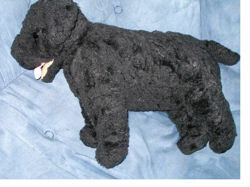 If you can help Wendy find this Large Black TY #2008 Cinders Dog, THIS SITE IS NO LONGER ACTIVELY MANAGED. Please use Our FREE FACEBOOK GROUP, including #100308-1 in the subject, . Ebay Item number: 250163566647. Could this be Ty Barney Black Lab with tongue. Hello — his name is indeed Cinders. His item number is #2008. He was only made in this position in 1994 – he should be 20 inches long, but don’t worry if he is not because their measurements are not often accurate. As I said, made in 1994 only – in 1995- 1997 the same dog (Cinders) was made in a sitting position. Barney – as mentioned in the post above was made in 1990 – he retired in 1992 – the tush tag would not say 1994. FYI – there is an adorable little pup that is “baby brother” to Cinders – his name is Ashes, I say Baby Brother because he is only 8 inches long – he is very similar – he is so cute. Thanks Tami, but Kimberly is sure that there was a Cinders version, so Barney is not it. I did a quick search for Cinders and found one place that may have him in stock, but they list him as #2088. OH WOW!!! Thank you guys soooooooooooo MUCH!!!!!!!!!!! How in the world did you find so much information on him?!? I looked for days!! LOL!! You provide a wonderful blessing here! Please keep up the good work and may many blessings be returned unto you as you are helping to bless others with this service! Over a period of time we have enlisted quite a few very knowledgeable folks, who are about as addicted to this Search Service as I am. Without them, it would not work. I have learned from experience that they know a whole lot more about toys than I do!!! Now, if this site I found REALLY has the dog in stock …. that’s the problem, as Wanda the elephant searchers have discovered. Very disheartening to think you have found it, only to be looking at a website that is not up to date.